So, I finally made it back to the cinema! This time it was to see the long-awaited Up, the first film I’ve ever seen in 3D. I have to admit I was sceptical at first, I grew up in the age of those horrible green and red cardboard things and was a bit worried that seeing a film in 3D might be more annoying than exciting. Turns out 3 D glasses have come a long way, still not the most attractive thing in the world, but in the case of Up you end up looking quite a lot like our lead character which made me laugh every time I looked around the room. As for the effects themselves, I think the jury is still out. At times, the 3D was really cool, particularly in the wide angle shots of landscapes, and it did bring the action to life, but at other times I found it a bit distracting, and I couldn’t help continually taking off my glasses to see what the screen looked like without them. (Blurry, if you’re wondering). I think with an animation like Pixar, 3D is a good thing, as it carries on what the computer has begun, but I’m not sure I’d like to see it spill into mainstream cinema too much. There is a definitely increase in the number of films being released in 3D, so I guess it’s something I’ll be getting used to. The trailer for the new Christmas Carol which came before was a clear example of 3D being just right, as the falling snowflakes really did look amazing in 3D. Onto the film itself. My first impression of Up is how shockingly sad it is! We’re talking Bambi’s Mum here. I’d seen a news report earlier about Up being one of the few films that has made men cry but kind of shrugged it off…turns out they were right. It’s the opening montage that does it, where we find out how Carl Fredricksen goes from a cute little kid to a grumpy old man. 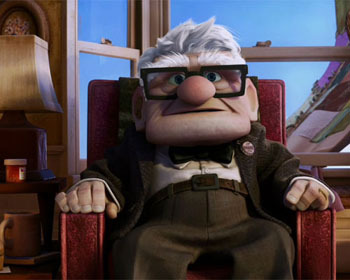 Up is an unusual film for Pixar, because it tackles some pretty adult content about loneliness and loss, and is one of the only films I can think of that centres almost entirely around a grumpy old man. It might not quite stand up to some of its predecessors, but it is a good film, and I guess we should hand it to them for taking on a storyline you wouldnt expect in a kids’ film. 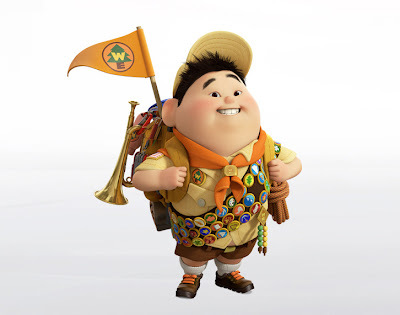 Once you get over the sad opening, there are some brilliant funny moments in the film, provided mainly by the counterpoint between Carl and cute boy scout Russell. There were at least 3 things that had me laughing out loud, and the way that both characters are drawn adds to the contrast, with Russell pretty much ball-shaped, while Carl has an almost perfect square for a head. The plot of the film is good too, there were a couple of times when I thought an obvious ending was approaching and was surprised to find the story heading in a different direction. At 96 minutes it never drags, and is basically a fun ride from beginning to end. One thing I did like was the new way Pixar has found for its animals to talk, stepping away from the Disney norm of all creatures great and small speaking perfect English-well, sort of. There are actually very few characters in the film. Apart from Carl and Russell, there’s comic relief dog Dug, quintessential bad guy Charles Muntz, and that’s about it. Because of this, the film feels quite small despite the grandeur of its setting, with the floating house actually not having an awful lot to do with it in the grand scheme of things. I think this works with a film like this which is really about the development of one character-Carl. As I’ve said before, it’s unusual for any film, especially a kids film, to invest so much in a crotchety old man, but Pixar somehow manages to make him just loveable enough for it to work. I’m betting that opening montage has a lot to do with it. Also a departure for Pixar is the lack of all-star voice talent. Apart from Christopher Plummer inhabiting our villain, the rest of the voices come from relative unknowns or one of the films directors (Bob Peterson). At times, it can be distracting having a really recognisable voice in a film so it was nice to be able to only have one character with whom I associate the voice. Altogether I think Up is a worthwhile family film with enough in it to keep the big kids (i.e. me) happy and lots of bright colours and flying about for the little ones. I did kind of get the impression that this was a film for boys, (there’s really only one female character in the whole film, and she’s called Kevin!) and the more I thought about it, the more I realised that quite a lot of Pixar films are leaning more towards the male than female market. In Toy Story we have Andy with typical boy toys: cowboys and space men; Finding Nemo is all about a boy and his father, Cars is just obvious…the only one I could think of with a more feminine air was Monsters Inc, and that’s just for Boo, because otherwise that’s quite a boyish film too. It’s not necessarily a criticism, but I wonder if Pixar have noticed how many of their films centre around a young male character with, more often than not, and older male representing some kind of lost father figure. I’ve mentioned before the Hollywood obsession with “Daddy issues” and it seems that Pixar, and all of Disney in fact, might be some of the biggest culprits. ‘Course if you’re like me and tend to prefer the boy films then it’s not really an issue. I loved this movie, however I preferred the 2D version over the 3D version. The 3D version drained the vibrant color out of the picture too much for my liking, and I honestly didn’t feel the 3D added enough to be worthwhile. Great review! I couldn’t agree with you more that Pixar is spot-on by not casting big name celebrities to voice every character. Sometimes I wonder if other animation studios know how far that tricks jars me out of the story. I want to watch a story about an old man, a little boy, and a flying house…I don’t want to be snapped back to reality when I realize the monkey is voiced by Angelina Jolie. I also agree with ya that Pixar might want to lean away from the 3-D…didn’t seem to add to much to this flick. Loved this piece – keep up the good work! Bill: I did notice during my frequent glasses flicks that the colour was better without. I think I would want to see it in 2D now. And I wouldnt watch the DVD in 3D. Mad Hatter: Exactly my point, sometimes the celeb voices can be distracting. I wasn’t against the 3D exactly. Call me old skool but I reckon the moving pictures are enough without them jumping out. Doesn’t really add or detract. Worth a try though I guess, I just wouldn’t seek it out. Great review. I had never thought about Pixar gearing towards males before so thats a very interesting point, but that doesnt really bother me as I was always pretty much a tom-boy growing up. But yes, this film does go for the adult theme of being alone and I couldnt agree more with your description of the opening montage of Carl’s whole life. Caz: I hadn’t noticed either, it just kind of dawned on me….is kinda weird. I’m still waiting to see this one, but I might end up seeing it on DVD. Interesting note there about Pixar films leaning more for the male market with their boy/father-figure issues, but somehow I’m ok with that. My fave Pixar flick is still Finding Nemo, let’s see if ‘Up’ will top that one. Btw, have you seen Chicken Run? I LOVE that movie, and the protagonist is a ‘female’ chicken, Ginger, voiced brilliantly by Julia Sawalha (from BBC’s Absolutely Fabulous). I’m not sure it’ll top Nemo but it is good. I have seen chicken run. Genius from Nick Park. I think that might be one of the most British films ever. It’s a brilliant parody of the Great Escape. In fact it’s got a more interesting plot. Damn Pixar — those wonders of animation keep making movies that are deeper and deeper. I cried during “WALL-E” — he almost lost EVE, dammit! 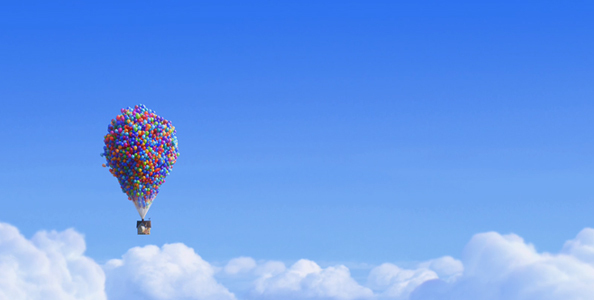 — but that didn’t hold a candle to the waterworks that “Up” brought on. Such a heartbreaking and uplifting film. Good stuff Katie, I think Up was easily the film of the year, and will be surprised if it doesnt get a Best Picture Oscar nod. That opening montage slayed me, I was nearly in floods! Nostalgic stuff in film normally makes me queasy, but in Up (the personification of the house, the bottlecap badge, etc) I welled up every time. Excellent point re Piaxar and its male leanings – I never noticed before. But us boys have suffered through decades of Disney Princesses hogging the show – bout time the balance was redressed! You’re right it’ll definitely be in that best animated film category and it might even make it into the big leagues. Glad you found my Pixar post — the whole gender bias is an issue that’s really been bugging me for a while. If you’re at all curious, [here’s a list] of posts where I’ve either rambled about it or linked to someone else rambling about it, and more specifically, [here’s my thoughts on _Up_], which I didn’t end up liking very much (and the gender bias issue was a large part of it). I love Pixar’s animation, and (most of the time) their stories are really good, but this is one aspect I have serious issues with. Thanks for the links I’ll take a look. I’m not so much angered by it as intrigued. I guess in a way the Disney Princess phase kind of balances out the Pixar boys club.